Kristen Elizabeth Atchison, originally of Summerville, SC. 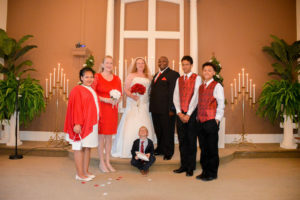 the daughter of Rhonda Cherie Moore, Bruce J. Feller and the Late Lawrence T. Atchison and James Allen Richardson, originally from Manning, SC, the son of Cynthia Richardson and the Late James Richardson were united in marriage on Saturday, November 5, 2016 in the chapel at Wedding Chapel by the Sea in Myrtle Beach, South Carolina. Rev. Pam Muise officiated. The couple will honeymoon in Myrtle Beach, SC before returning to Sumter, SC where they will reside.